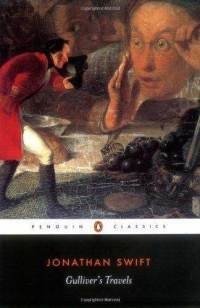 I decided to read this book after learning that I would soon have the opportunity to attend a college class session about Jonathan Swift and Alexander Pope. I had never read any work by these writers before, so I chose this one to start with because it is one of Swift’s most well-known pieces. I didn’t know much about it before diving in, so my mind was wide open and free of expectations. To put it simply, this novel was okay. Let’s start with the positive aspects. I really liked the creativity and originality of this story, especially in regard to the different societies that Gulliver encounters. No, the idea of really small and tall people isn’t anything new, but the way he executes the concept is certainly unique. He focuses primarily on the political and cultural aspects of these people in comparison to his home back in England. These worlds that Swift has created are incredibly detailed and complex, and it’s a wonder that he was able to incorporate so many different fictional societies into one novel. The intricacies of these foreign societies greatly intrigued me, and if it weren’t for them I would not have enjoyed this novel nearly as much as I did. With that being said, I did have some issues with this novel. My primary complaint is that it was quite dull in many parts, but this could have been my own fault. I understand that this story is very satirical and is referencing England in the 1700s for the majority of the novel. However, due to my lack of knowledge concerning this time period in England I think that most of the satire and meaning of this story went right over my head. I do not doubt that if I had been educated on this subject then I would have found this novel much more entertaining and interesting to read. Unfortunately this was not the case, and therefore slogging through a lot of this book was a struggle. Overall, my feelings toward Gulliver’s Travels are mixed. I think this is probably going to be a classic that I reread in the future when I know more about the time period in which it was written and how it relates to the political and social values of the society Swift lived in. Would I recommend it to a friend? : It honestly depends. If they are very interested in this time period, then probably. Otherwise it would not be at the top of my list of books to recommend. Have you ever read this book before? What did you think of it? Let me know in the comments section below! Next > taylor swift book tag.